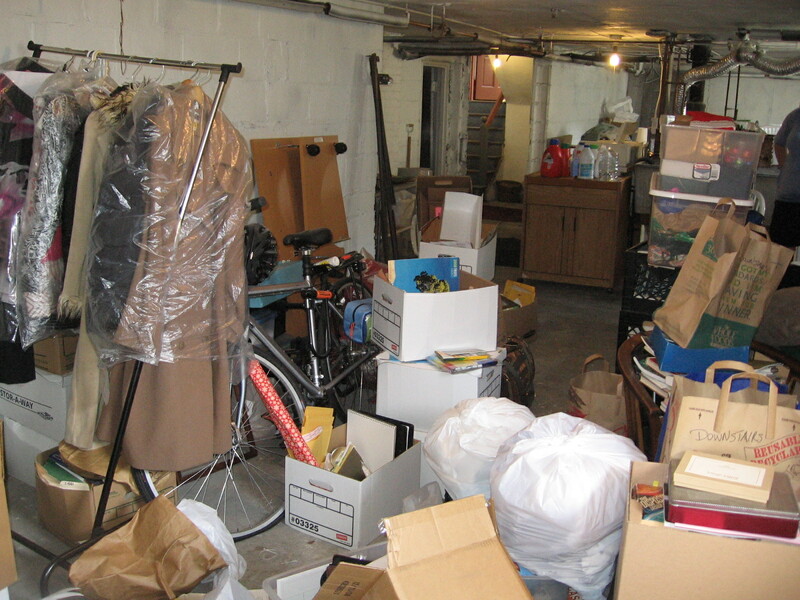 I recently caught a snippet of an interview where a person referred to her garage as ‘my room of failure’. She went on to say: “I look around my garage and see everything I’m not good at, all the items I don’t know where to put, all the hobbies that I never get to. I look around me and all I see is failure”. This resonates with me. When I lived in Oregon our garage was incapable of holding the two cars it was designed for. Over 20 years of raising children we collected family photos, toys, school craft projects, trophies. Such accumulation carried emotional ties that I wasn’t ready to sever by giving the stuff away or sending to the dump. Eventually we moved to Massachusetts and carried much of our emotion laden stuff and general clutter with us. It cost effort and money to do so. Now we are in a house half the size. We have a small basement and no garage. While we downsized by 1/2 we still have too much stuff to store. In addition to the emotion laden objects we also have my tool bench. Another area of failure. I’ve accumulated tools that for the most part I don’t know how to use. Those that I do know how to use (screw driver, ratchet set, drill bits) often have missing pieces or are jumbled up in boxes. When I look at my tool bench I’m reminded of what I can’t do or can’t find. A professional organizer would tell me that disorganization and emotional clinging gets in the way of my living in the now. An organizing guru (they seem to be everywhere) recommends the following steps: Make a list of what I love (keep); what I’m somewhat emotionally connected to (take a photo of my kids 3rd grade painting and get rid of); what I need (screwdriver, pliers, drill) and what I don’t (that box of empty picture frames, 30 year old hockey skates and box of slightly used coffee mugs). As my jumbled, cluttered basement goes, so goes my life. The pros say that as we jettison our stuff we begin to feel lighter emotionally. As we donate, put in recycling or into the dumpster we make room for our heart, mind and imagination to expand. On a spiritual level I know this to be true. When I do make the time to de-clutter I sense that my heart and soul open up. Within me there is tension. A part of me that wants to accumulate and hoard. Another part that wants to let go, get rid of, make space for. Which part of me will win? Depends on the day. Oh my I’m in worse shape than you folks. I not only have my own “stuff” but My Mom’s and Aunt’s. I’m really hopeless! Marge, I know the feeling. So much of what we have has emotional attachments. I have such good memories of being in your mom’s house. Always so welcoming.